WASHINGTON (AP) -- Challenging lawmakers, President Barack Obama will announce Tuesday night in his State of the Union address that he's raising the minimum wage for new federal contract workers to $10.10 an hour, underscoring a go-it-alone strategy in an election year critical to both parties and the balance of power in Congress. Obama's speech to a joint session of Congress and millions more watching at home will be wrapped in a unifying theme: The federal government can play a key role in increasing opportunities for Americans who have been left behind, unable to benefit from a recovering economy. Yet the president will deliver a split message, pressing issues that will distinguish him and other Democrats from Republicans in the 2014 midterm elections. Illustrating his willingness to act on his own, the White House says Obama will announce that he will sign an executive order increasing the minimum wage from $7.25 to $10.10 for new federal contracts. The measure would not affect private companies' existing contracts, except it would apply to renewals if other terms of an agreement changed. As a result, the order would benefit far fewer workers than the number foreseen by advocates of federal contract employees. Still, the issue dovetails with what will be Obama's broader call for an increase in the broader national minimum wage to $10.10 and for future increases to be tied to inflation. Obama last year had called for an increase in the national minimum wage to $9. Even as he argues that low-income Americans and many in the middle class lack the means to achieve upward mobility, Obama will also take credit for an economy that by many indicators is gaining strength on his watch. As a result, he will talk positively about a recovery that remains elusive to many Americans. The president will present Congress with an agenda largely unchanged from what he called for a year ago, but one that nevertheless fits into this year's economic opportunity theme. He will continue to seek an overhaul of immigration laws and expanded pre-school education as well as an increase in the minimum wage. But after a year in which those proposals languished and gun control failed, the White House is eager to avoid letting Obama be defined by quixotic ambitions. As a result, he will stress success through his executive actions, though their reach would be far more modest than what he could achieve through legislation. "Congress is slow to action and we're not going to wait for that," White House chief of staff Denis McDonough said in an interview on "CBS This Morning." House Speaker John Boehner, R-Ohio, shrugged off Obama's minimum wage increase for federal contractors, noting its limits. "So the question is how many people, Mr. President, will this executive action actually help. I suspect the answer is somewhere close to zero," he said. Boehner warned against raising the minimum wage nationally, arguing that "when you raise the cost of something, you get less of it." "It's bad policy, and it will hurt the very people the president purports to help,' he said. The biggest and most lasting accomplishment of Obama's second term could be immigration legislation. House Republican leaders have sent signals that they are willing to act on piecemeal legislation, and Obama has given them room to work without prodding. However, House conservatives are pushing back against any bill that gives legal status to immigrants who are in the country illegally. And some Democrats would prefer to use the unresolved issue to mobilize Hispanic voters for this year's elections. Among those actions is a new retirement savings plan geared toward workers whose employers don't currently offer such plans. The program would allow first-time savers to start building up savings in Treasury bonds that eventually could be converted into a traditional IRAs, according to two people who have discussed the proposal with the administration. Those people weren't authorized to discuss it ahead of the announcement and insisted on anonymity. 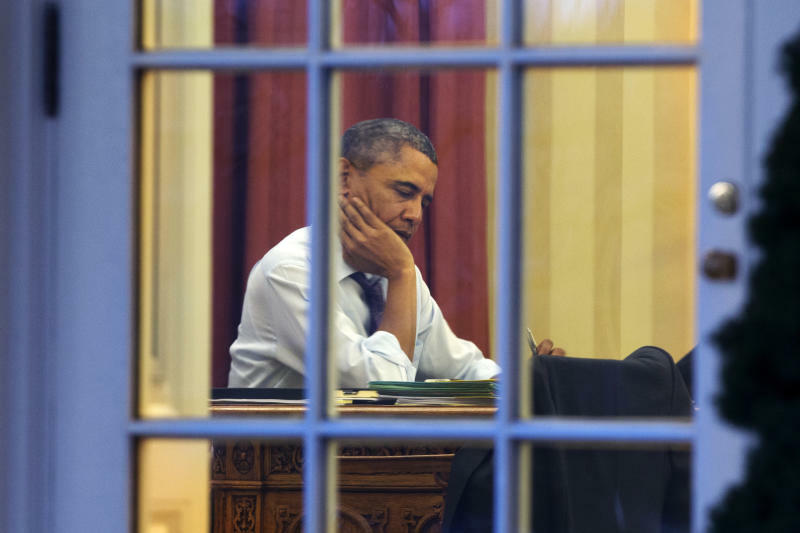 Obama's go-it-alone approach has already irritated Republicans. "We're going to watch very closely because there's a Constitution that we all took an oath to, including him," Boehner said Tuesday. Obama will follow his address with a quick trip Wednesday and Thursday to Maryland, Pennsylvania, Wisconsin and Tennessee to promote his proposals. On Friday, Obama will hold an event at the White House where he'll announce commitments from several companies to not discriminate against the long-term unemployed during hiring. Following tradition, the White House has invited several people to sit with first lady Michelle Obama during Tuesday night's address. Among them are General Motors CEO Mary Barra and Cristian Avila of Phoenix, an immigrant who with two younger siblings was brought to the U.S. illegally when Avila was 9. Now 23, Avila has benefited from an Obama policy allowing young people who immigrated illegally with their parents to avoid deportation. Other guests include two survivors of the Boston Marathon bombing and Jason Collins, an openly gay former NBA player. Boehner's guests include employers in his district who he says are struggling under Obama's national health care overhaul. Associated Press writers Donna Cassata and Josh Lederman contributed to this report.